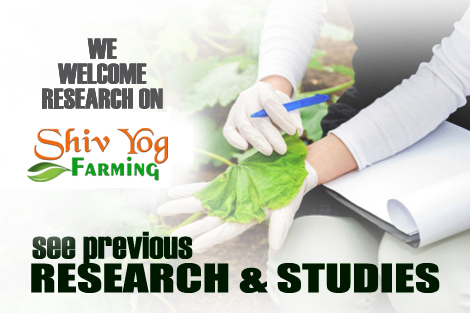 #ShivYog #AVSFarming #CosmicHealing #Nourish #Heal #Soil #Healing #Agriculture #Environment #Abundance #Peace #Nectar #FoodForAll SHIV YOG AVS FARMING: SUCCESS STORIES 33Shiv Yog AVS Agriculture is helping fertility microbes regenerate in the soil, doing away with the need for artificially boosting soil fecundity. As this Shiv Yog Farmer from Rajasthan narrates, weeds and pests become a thing of the past when cosmic energy of infinite dimension engulfs the farm ov a sincere practitioner of Shiv Yog AVS Farmimg. "Now, only natural, organic manure is needed, market fetches us prices of 10-20 quintal additional crop, those who buy our produce come back to extol the virtues of its peculiar taste, goats, cows and buffaloes report more milk, there is peace, happiness and togetherness in the family. With Shiv Yog Sadhna, we are all marching towards development and progress," puts the son of soil from the land of forts and palaces, now on the path to becoming a king of farming. Shiv Yog Cosmic Agriculture is helping fertility microbes regenerate in the soil, doing away with the need for artificially boosting soil fecundity. As this Shiv Yog Farmer from Rajasthan narrates, weeds and pests become a thing of the past when cosmic energy of infinite dimension engulfs the farm ov a sincere practitioner of Shiv Yog Cosmic Farmimg. “Now, only natural, organic manure is needed, market fetches us prices of 10-20 quintal additional crop, those who buy our produce come back to extol the virtues of its peculiar taste, goats, cows and buffaloes report more milk, there is peace, happiness and togetherness in the family. With Shiv Yog Sadhna, we are all marching towards development and progress,” puts the son of soil from the land of forts and palaces, now on the path to becoming a king of farming.